In this noisy world, introverted children are often misunderstood. Therefore, Quiet Kids by Christine Fonseca offers parents not only an understanding of introverted kids but also how best to teach them to thrive in an extroverted world. Using tip sheets, checklists, and workbook-style tasks, Fonseca presents parents with insights into helping their introverted child succeed. Everything from society’s assumptions about introversion and extroversion to how introversion plays out in the educational setting is addressed with not only scientific explanations but also relevant anecdotes, which makes for a good resource. Fonseca begins by addressing the negative connotations often associated with introversion and how the Western world favors extroversion. Then, she explains how introversion is actually a matter of hardwiring. Fonseca claims it’s not a personality trait one acquires; rather a temperament one inherits. (Think nature versus nurture.) Once parents (and teachers) recognize the different temperaments in their households (and classroom), they can do a better job of meeting children’s needs. According to Fonseca, both temperaments have positives and negatives. She explains, “Extroverts can burn out from the overreliance on the sympathetic nervous system and the resultant desire for continuous stimulation.” Whereas, Fonseca adds, “Introverts can become overly withdrawn when left alone for too long…[or] agitated when they have to spend too much time in social situations.” An introvert can teach an extrovert to relax and an extrovert can help an introvert to socialize. The key is seeing the value in both temperaments. Unfortunately, introverts are often misunderstood in school. They are frequently mislabeled as shy or viewed as narcissistic. When in reality, Fonseca argues, “They are deep thinkers interested in deep feelings and beliefs. In this way, they can be strong contributors to groups if their need for a calm environment can be met or when the groups can be managed to maintain a small number.” however, in this peer-share and group tasks era, Fonseca believes introverts are pushed to speak more, which actually limits their creativity since it reduces the “downtime” they require. That’s why Fonseca believes it’s important for parents become advocates for their introverted children. Setting a foundation for predictability is the best way to reach introverts. Fonseca writes it allows for organized periods of rest. My younger daughter is introverted like my husband, and I’ve learned over the years that if I periodically block off hours, afternoons, and days for quiet time everyone gets along much better. Fonseca also encourages parents to establish “personal space” and promote “privacy” so that all members of the household get some “alone time.” Doing so will allow introverts to recuperate from otherwise busy lives. Otherwise, as Fonseca notes, introverts are left feeling stressed and this might leave them unable to cope. She explains, “Pressures felt during a test may be enough for them to shut down and withdraw or become overly agitated.” Therefore, Fonseca offers parents relaxation methods to teach their children as well as stresses the importance of talking with your children about whether they are relaxed. Fonseca also examines how introverts learn and her ideas on shifting the focus from results to process are helpful. Essentially, Fonseca explains what’s important for parents (and teachers) to keep in mind is that “introverted children are highly resistant to change.” She claims, “They would rather suffer through an unpleasant situation than risk taking action and having a worse scenario.” As a result, Fonseca insists that we must help introverts become comfortable in developing a tolerance for change if they are going to be successful. 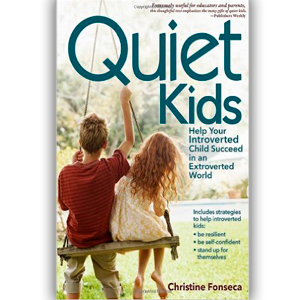 So if you’re interested in learning more about helping your introverted child thrive in an extroverted world, then check out Quiet Kids by Christine Fonseca for further insights. Follow @ParentbytheBook on Twitter for updates on blog posts or like Parenting by the Book on Facebook.